A large set of variant AoK animal slps, including six wolves, seven deer, three jaguars, seven birds, three bears, a llama, a sheep, and 27 horses. Feel free to use them as long as you give credit! This is a really handy addition to the Blacksmith, Vardamir. Thank you for sharing. Those horses look good. I always thought the AoC horse was missing its hair or something. That's a lot of new resource for future projects, thanks! Vardamir's Wildlife Pack is a simple resource for modders to add additional animals into their scenarios and Mod Packs. I can vouch for the usefulness of this Mod Pack as Vardamir previously sent me some of his animals to use in a Mod Pack I am creating. The animals allows for more variety and eye-candy in the editor. This is one of the first Mods that specifically focuses on animals that I have come across which makes it unique and extremely useful. The animals are coloured really well and blend in excellently with the other graphics in the game. All of the units have been organised into their own folders which have again been categorised into other folders (all horses are in a horse folder for example). Each animal also has its own custom icon. 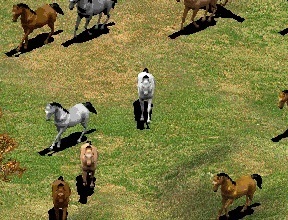 Hey Vardamir, would you include this Gazelle from AOE1 to this pack? It could be done, but I'm not sure why. That's already a pretty accessible graphic that I didn't make. That file is already to be resize, but I got problem in the contrast/light of the graphics. Yeah, the colour need more bright.